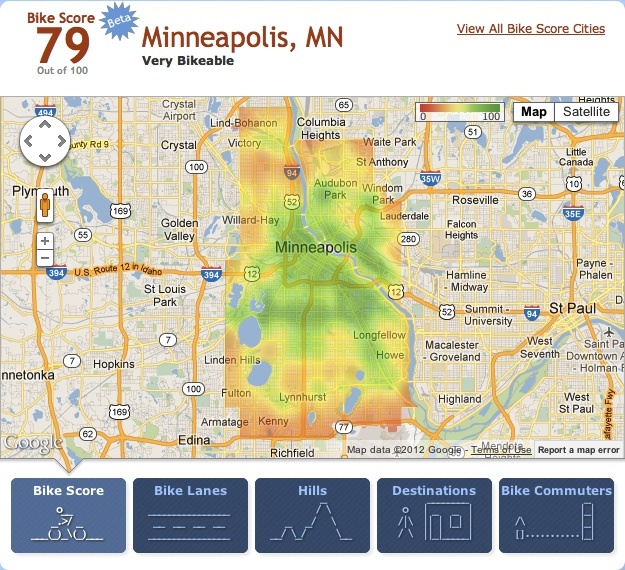 The next stage from the folks at Walk Score, Bike Score, is now available, for a select 10 cities. There aren’t any big surprises, Minneapolis, San Francisco, and Madison are at the top. Sacramento is not on the list of 10. If you’d like to see it there, you can go to the Bike Score page and tweet a vote for it. Please do! Walk Score also recently released Transit Score, where Sacramento is listed, as 22 out of the 25 largest cities with accessible transit data, at a score of 32. Both the Bike Score and Transit Score are created at a city-wide level, unlike the address-specific Walk Score. So these rankings are just first steps, but nevertheless interesting and useful. You may have seen articles in the media recently about the high correlation between walkability and housing prices, with walkable communities in high demand and unworkable suburbs in the doldrums. This is good news for all of us. Walk Score was in fact designed as a tool for helping people find real estate and apartments in places that fit their desired lifestyle. As the correlation between walkable, bikeable, transit-dense communities and livability becomes more clear, resources (societal and personal) will be shifted away from the suburbs to urban areas.